THE days of school children queuing up in science labs to squint down a microscope are over, thanks to a new gadget. Thousands of new electronic microscopes, which project an image on to a computer screen, are to be provided for UK schools using National Lottery money. And city boffin Brian J Ford has been signed up to help explain to children how to use the hi-tech piece of equipment. Mr Ford, who is a broadcaster and expert in many fields of science, is working on a 32-page full-colour manual which will be used by every child in the country. The manual will explain how to use the small, blue Intel Play QX3 microscope, which costs around £50. One will be provided for every secondary school in the country by the lottery-funded National Endowments for Science, Technology and the Arts agency. Mr Ford said he had been having fun playing with the new gadget in preparation for writing the book. He said: "Although it's called a play microscope, this really is a breathtaking new idea. "Ive been getting some really interesting images with it. We've used it on hundreds of things, from algae to blood in the tail of a tadpole. The microscope actually contains three individual lenses, each one precisely calibrated to handle a different magnification. Images can be magnified by 10, 60, or 200 times. "You can point it at something, get a colour image and print it out straight away, which is a big leap. In the science world its comparable to the jump from LPs to compact discs." SCIENTIST Brian J Ford is no stranger to microscopes. 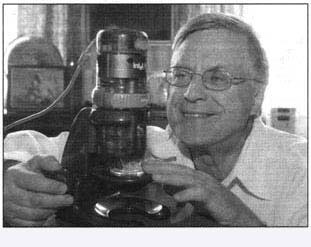 Back in 1973 he wrote a book called the Optical Microscope Manual which is still used today. And in 1998 he invented a tiny microscope for use during space missions. But his latest manual, teaching children how to use the new QX3 digital microscope, is his first book for almost 10 years which is designed for youngsters. In 1993 he published the Firast Encyclopedia of Science, which was aimed at a younger age group. Return to Manual home page. See also the previous profile or move to next profile article.